The main theme of this book is that, within contemporary capitalist societies a materialist outlook informed by science has triumphed creating the lack of a spiritual dimension to give meaning and purpose to the activities that are necessary for a capitalist society to function effectively. Capitalist societies are in trouble and need to be restructured to provide for the material needs of all the people who work within the system, not just the one percent, but because of the lack of a spiritual connection with each other and with nature this is not likely to happen. It has been said that society and the organizations within treat one another as objects to be manipulated in the interests of promoting economic growth and treat nature as an object to be exploited for the same purpose. This way of treating each other, and nature, is consistent with the way a capitalist system has worked in the past and was supposed to enable it to function efficiently to provide a fulfilling and enriched life for all its adherents through growth of the economy. However, as capitalist societies have become dysfunctional they will need a different kind of orientation to continue in existence. 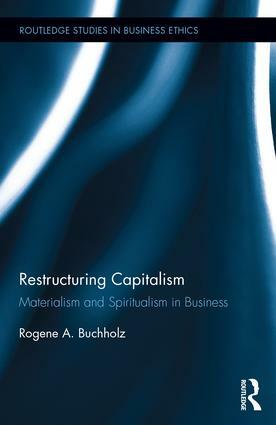 Restructuring Capitalism: Materialism and Spiritualism in Business argues that what is needed is a new sense of a spiritualization of the self and its relation to others and to the establishment of a spiritual connection with nature in order for capitalism to be restructured to work for everyone and for the society as a whole. Rogene A. Buchholz is the Legendre-Soule Chair in Business Ethics Emeritus in the College of Business Administration at Loyola University New Orleans. He has published over seventy-five articles and is the author or co-author of twelve books in the areas of business and public policy, business ethics, and the environment.